A new statue of David Bowie that was unveiled in Aylesbury, England on March 25th was vandalized less than 48 hours later. 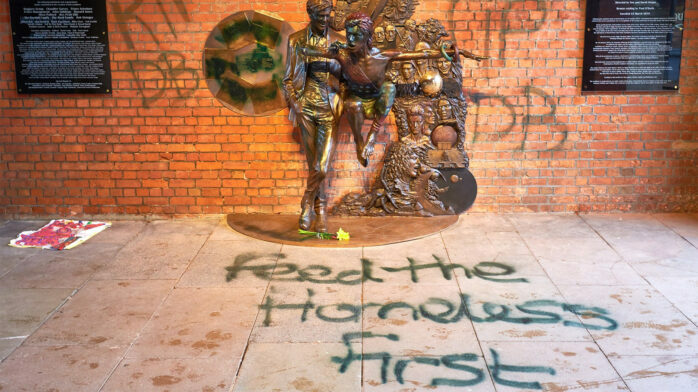 RIP DB was sprayed behind the statue, while Feed the Homeless First was painted in green on the ground in front of the it… an apparent reference to someone feeling that taxpayer money should be spent on other things. The bronze sculpture, named Earthly Messenger, was privately crowdfunded through grants, and over £119,000 was raised (on a £100,000 goal) by Bowie fans via a Kickstarter campaign.